WEST WINDSOR – The role of trial court administrators in the criminal justice system will be the topic of a lecture at Mercer County Community College (MCCC) on Wednesday, Nov. 5. Giuseppe M. Fazari, trial court administrator in Union County, N.J., will present an overview of the court management profession, principles of court administration models and the organization of courts during his lecture “The Relevance of the Court Management Profession to the Third Branch." The talk will be held at noon in Room 109 of the Communications Building on the college’s West Windsor Campus, 1200 Old Trenton Road. The lecture is free and open to the public as part of MCCC’s Distinguished Lecture Series. Fazari will discuss the purposes and responsibilities of the courts, and will analyze the model in which the system is grounded – along with the review and implications posed for a rule-of-law society. The presentation will cover lessons learned, and the decision-making process in a management field that is often unseen, yet is critical to the judicial process. As trial court administrator for the Superior Court of New Jersey, Union Vicinage, Fazari directs the allocation of resources for an organization that comprises 460 employees and 27 judges, with an annual budget of $32 million. He holds a doctorate in Higher Education Administration from Seton Hall University, where he earned a master’s degree in Public Administration and a bachelor’s degree in Criminal Justice. 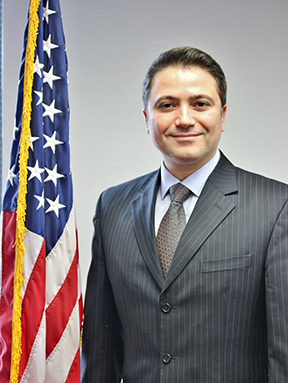 Giuseppe M. Fazari, speaker for the November 5 Distinguished Lecture at Mercer County Community College.